If you close your eyes and conjure up the quintessential romantic image of Africa, what you’ll most likely imagine is Tanzania: the drama of the wildebeest migration along a seemingly-endless savannah; the incongruous snow and glaciers of Mt Kilimanjaro; the iconic and statuesque Maasai warriors; the exotic palm-fringed beaches on the spice islands of Zanzibar. It’s all here. Tanzania boasts some of the most impressive national parks and game reserves in Africa. The Serengeti National Park is considered the continent’s premier spot to see wildlife roam unheeded across vast open plains. Nearby, within the steep walls of the Ngorongoro Crater lies the most densely concentrated population of African mammals on earth. Not to be forgotten, the Selous Game Reserve is larger than Switzerland, and is wild, remote and still virtually untouched by humans. Even further from the beaten path are parks in the extreme west of the country which offer the unique opportunity to track chimpanzees in their natural habitat on the fringes of Lake Tanganyika, one of Africa’s Great Lakes. 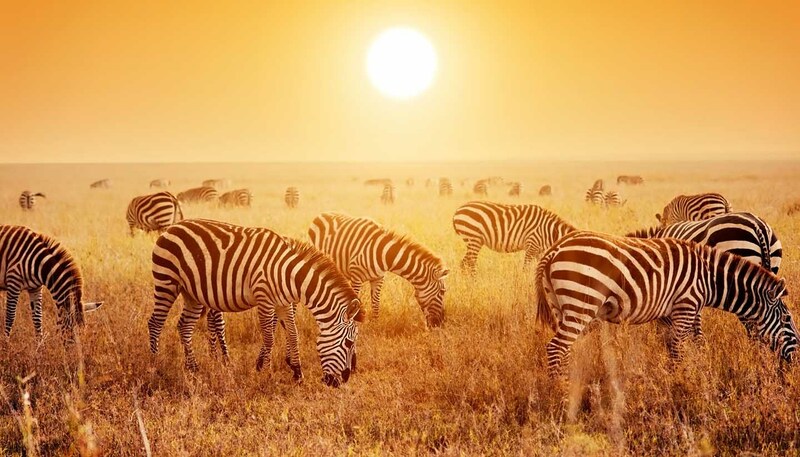 Beyond its safari stalwarts, Tanzania has no less than 804km (503 miles) of sublime coastline and pearly-white beaches with some magnificent islands offshore. Known as the Swahili Coast, this was a favoured stop on ancient trading routes between the Indian sub-continent and the Middle East. Spices, jewels and slaves once passed through, bringing with them a mélange of cultural riches that remain today. Tanzania’s not short on mountains either. The striking and snow-capped Mt Kilimanjaro is Africa's tallest at 5,895m (19,341ft) and climbing it is an unforgettable experience. Its slightly smaller sister Mt Meru is arguably even prettier, and a quicker climb. Tanzania is home to more than 120 different ethnic groups and cultures, but it has seen little of the ethnic or religious-based violence that has afflicted certain other nations in the region. In fact the country is an inherently peaceful place and embraces its multicultural heritage, which adds to its broad appeal. 945,087 sq km (364,900 sq miles). President John Magufuli since 2015. Zanzibar is semi-autonomous and has its own parliament and president (President Ali Mohamed Shein since 2010). President John Magufuli since 2015. Around 75,000 British nationals visit Tanzania every year. Most visits are trouble-free. Although most visits to Tanzania are trouble-free, violent and armed crime is increasing. Take sensible precautions to protect yourself and your belongings. If you need to contact the emergency services, dial 112 and ask for the emergency service you require. Terrorists are likely to try to carry out attacks in Tanzania. On 1 August 2018, an outbreak of Ebola was declared in Beni territory, North Kivu Province in the Democratic Republic of Congo. Passengers travelling from the DRC may be subject to health screening at ports of entry in Tanzania. There is a threat of piracy in the Gulf of Aden and Indian Ocean. In the last few years there have been several ferry disasters in which hundreds of people have died. If you believe a ferry is overloaded or not seaworthy, don’t get on. Long distance buses are often involved in accidents which can be fatal. Although most visits to Tanzania are trouble-free, violent and armed crime is increasing. The British High Commission continues to receive regular reports of British nationals who are the victims of mugging and bag snatching (especially by passing cars or motorbikes) and armed robbery and burglary have increased throughout the country. In December 2016, a European family were robbed at gun point and their campsite guard killed at south Beach, 20km southeast of Dar es Salaam. In Dar es Salaam, British tourists have been kidnapped, assaulted, robbed and forced with the threat of violence to withdraw cash from ATMs and arrange cash transfers of up to £5,000 through Western Union after being befriended by strangers or using unlicensed taxis. Walk as far away from the road as possible and avoid walking and cycling at night. If you need to walk alongside the road, walk towards the traffic. Avoid carrying large amounts of cash or other valuables including expensive jewellery or watches. Leave your passport in the hotel safe and carry a photocopy for ID. If you’re attacked, don’t resist. If you carry a bag, it is safer to hold it loosely by the handle or hanging off your shoulder rather than by securing the strap across your chest. Both pedestrians and cyclists have been targeted by bag thieves. Don’t accept lifts from strangers or individuals offering to procure a licensed taxi on your behalf. Don’t use unlicensed taxis. Where possible, you should arrange a taxi through a reputable establishment, for example a hotel, and you should always ask to see the driver’s ID. App-based taxi services are not reliable. Avoid walking and exercising alone, particularly in isolated areas and on beaches. Take particular care in places frequented by tourists and expatriate residents. In Dar es Salaam, tourists and residents have been targeted in the city centre, at Ubungo bus station, the Masaki/Oysterbay peninsula area, particularly at Coco Beach and along Toure Drive. In Zanzibar incidents have taken place in Stone Town and at hotels and on popular tourist beaches. There has been an increase in the number of residential burglaries in Zanzibar and Arusha in 2018. Make sure residential property is secure and lock all doors and windows, especially at night. Your security guard should insist on official identification before allowing anyone to enter your property or compound. If in doubt don’t let them in and raise the alarm. You should remain vigilant at all times. In October and November 2017, there were 2 accidents affecting Coastal Aviation flights to the Serengeti National Park. In the most recent incident, all 11 people on board were killed. If you’re planning to travel to a neighbouring country or across the region, make sure you check our travel advice for each country you intend to visit. Information about travel in remote areas can be patchy. Invest in an up-to-date travel guide and only use reliable tour companies. Take particular care in the area bordering Burundi/Kigoma region. There have been armed robberies in this area, including vehicle hijackings. Drive only in hours of daylight. There are few facilities for visitors. Take great care near the border with Mozambique. The Foreign and Commonwealth Office (FCO) advise against all but essential travel to the districts of Palma, Mocimboa de Praia and Macomia in Cabo Delgado province due to an increase in attacks by groups with links to Islamic extremism. This advice does not apply to islands off the coast of Mozambique. Check our travel advice for Mozambique for more information. Careful planning is important to get the best out of your safari. If you choose to camp, only use official sites. Make sure you are properly equipped and seek local advice when travelling to isolated areas. Some parks are extremely remote, and emergency access and evacuation can be difficult. There are risks associated with viewing wildlife, particularly on foot or at close range. Always follow park regulations and wardens’ advice, and make sure you have the correct documentation or permit before entering a national park. If you are trekking or climbing, only use a reputable travel company, stick to established routes and always walk in groups. Make sure you are well prepared and equipped to cope with the terrain and low temperatures. The extreme altitude on Mount Kilimanjaro can cause altitude sickness. In the last few years there have been several ferry disasters in which hundreds of people have died. These were ferries travelling between Dar es Salaam and Zanzibar, between the islands of Zanzibar and in the Lake Zone area. Use a reputable ferry company and if you believe a ferry to be overloaded or unseaworthy, don’t get on. Familiarise yourself with emergency procedures on board and make a note of where the life jackets and emergency exits are located. You should also beware of aggressive ticket touts at Tanzanian ports. Recent piracy attacks off the coast of Somalia and in the Gulf of Aden highlight that the threat of piracy related activity and armed robbery in the Gulf of Aden and Indian Ocean remains significant. Reports of attacks on local fishing dhows in the area around the Gulf of Aden and Horn of Africa continue. The combined threat assessment of the international Naval Counter Piracy Forces remains that all sailing yachts under their own passage should remain out of the designated High Risk Area or face the risk of being hijacked and held hostage for ransom. For more information and advice, see our Piracy and armed robbery at sea page. Road conditions are generally poor and driving standards are erratic. There are a large number of accidents, often involving inter-city buses. There have been a number of serious bus crashes that have resulted in fatalities and injuries to tourists. If you have concerns about the safety of the vehicle, or the ability of the driver, use alternative transport. If you plan to drive yourself during a visit to Tanzania, you’ll need your UK licence and an International Driving Permit. To drive in Zanzibar you’ll need your UK licence and a local Zanzibar driving permit (which you can get through your hire car company). Carry several copies of your driving licence, permits and insurance documents. Self-driving in Tanzania can be challenging and the quality of car hire companies is variable. Consider using reputable taxis as an alternative. There are no roadside rescue or breakdown services. Road maps are hard to come by and not always up to date. Service stations are infrequent and may not have supplies of fuel. Driving conditions in Tanzanian’s national parks can be unpredictable as the roads around the parks, mainly dirt tracks, are generally poor and can become hazardous or impassable after heavy rain. A 4x4 vehicle is often required. Avoid driving out of major towns and cities at night. Keep doors locked, windows up and valuables out of sight, as vehicles are sometimes targeted by thieves. Be particularly careful at night when there is a higher incidence of crime and drunk driving. Avoid driving out of town at night. If you become aware of an unusual incident, or if somebody in plain clothes tries to flag you down, it is often safer not to stop. There are frequent police road blocks. If you’re stopped by the police, ask to see identification before making any payments for traffic violations. If you’re involved in a road accident, co-operate with the local police. There have been several accidents on Tanzanian railways. Seek local advice for any long-distance train travel. Demonstrations and political rallies happen occasionally across Tanzania (including on the islands of Unguja (Zanzibar) and Pemba). Some have turned violent and resulted in fatalities. Police may use tear gas and/or live ammunition for crowd control. Keep up to date with local and international events and avoid all demonstrations and large gatherings. If you become aware of any nearby protests, leave the area immediately and monitor our travel advice, Twitter and local media for up-to-date information. Terrorists are likely to try to carry out attacks in Tanzania. Although Tanzania hasn’t suffered a major terrorist incident since the bombing of the United States embassy in 1998, there have been a number of smaller scale incidents. Most attacks target the local security forces, although attacks against western interests can’t be ruled out. Attacks could be indiscriminate, including in places visited by foreigners. Be vigilant at all times, especially in crowded areas and public places like transport hubs, hotels, restaurants and bars, and during major gatherings like sporting or religious events. Previous terrorist attacks in the region have targeted places where football matches are being viewed. Extremists linked to the Islamic terrorist group Al-Shabaab based in Somalia pose a threat across the east Africa region, and are thought to be active in Tanzania. There is also thought to be some support for Daesh (formerly referred to as ISIL). However, many incidents in Tanzania are of unclear origin and may be conducted by criminal gangs. Although there have been no significant terrorist attacks in Tanzania in recent years, the authorities in Tanzania successfully made a number of arrests in connection to terrorism throughout 2016.
in April 2017, several police officers were ambushed and killed in an attack in the Pwani coastal region, about 100km south of Dar es Salaam. Following the April 2017 incident, and reports of the murders of several local officials, there’s a heightened security presence in the area. On 29 March 2017, the Regional Commissioner of Pwani issued a decree covering the Rufiji area requiring drivers of motorcycles, popularly known as Boda Bodas, to stop carrying passengers at 6pm. You should take extra care when travelling in Rufiji and surrounding areas, including at police checkpoints and monitor local media for the latest information. Medical facilities are limited, especially outside Dar es Salaam. Make sure you have adequate travel health insurance and accessible funds to cover the cost of medical treatment abroad, evacuation by air ambulance and repatriation. Malaria, dengue fever and cholera are common in Tanzania. Isolated outbreaks of Ebola virus disease have occurred occasionally in neighbouring Democratic Republic of Congo, often in remote areas. On 1 August 2018, an outbreak of Ebola was declared in Beni territory, North Kivu Province in the Democratic Republic of Congo. Passengers travelling from the DRC may be subject to health screening at ports of entry in Tanzania. The latest updates can be found on the WHO’s website. There have also been cases of sleeping sickness occurring after bites from tsetse flies in the north, including the Serengeti. Other diseases, such as rift valley fever, occur mostly in rural areas where access to sanitation is limited. In the 2015 Report on the Global AIDS Epidemic, the UNAIDS/WHO Working Group estimated that around 1,400,000 adults aged 15 or over in Tanzania were living with HIV; the prevalence percentage was estimated at around 4.7 of the adult population. You should exercise normal precautions to avoid exposure to HIV/AIDS. If you need emergency medical assistance during your trip, dial 112 and ask for an ambulance. You should contact your insurance/medical assistance company promptly if you are referred to a medical facility for treatment. Tanzanians are welcoming and well disposed towards visitors, but you should be sensitive to local culture. Loud or aggressive behaviour, drunkenness, foul language and disrespect, especially towards older people, will cause offence. There is a high proportion of Muslims in Tanzania, especially along the coast and on Zanzibar and Pemba. Respect local traditions, customs, laws and religions at all times and be aware of your actions to ensure that they don’t offend, especially during the holy month of Ramadan or if you intend to visit religious areas. In 2019, the holy month of Ramadan is expected to start on 5 May and finish on 4 June. You should dress modestly. In Zanzibar and Pemba, women should avoid wearing shorts and sleeveless tops away from tourist resorts, and particularly in Stone Town and other places where the local population may be offended. There have been cases where women travelling alone and in small groups have been verbally harassed. Homosexuality is illegal in Tanzania (including Zanzibar) and is not tolerated in Tanzania’s conservative society. Public displays of homosexuality like holding hands or kissing in public places could lead to arrest and imprisonment. See our information and advice page for the LGBT community before you travel. Carry identification (a copy of your passport and visa/permit) at all times. Immigration officials and police have the power to request these documents at any reasonable time. If you’re a resident or longer term visitor, you should consider carrying a certified copy of your passport and visa/permit. If you’re planning to send your British passport to the UK for renewal/replacement while in Tanzania, the British High Commission recommends that you attend your local Tanzanian Immigration Service office and request a certified copy of your passport bio data page and any work/residence permits you currently hold. There are criminal laws on the protection of wildlife and fauna in Tanzania. Avoid bringing wildlife products such as jewellery into Tanzania as you risk delay, questioning or detention when trying to leave the country. These products, whether bought or received as a gift in Tanzania, are illegal. Foreigners have been arrested recently for trying to take products, including horns and seashells, out of the country without a certified export permit issued by the Ministry of Natural Resources and Tourism. If you’re caught you may be detained or fined. It is possible to get a tourist or business visa for a single entry on arrival at main ports of entry to Tanzania, but this is subject to the fulfilment of all immigration requirements. You may be asked to provide proof of your return journey. You won’t be able to get a multiple entry visa on arrival. For further information about visas visit the Tanzanian Ministry of Home Affairs website. If you are planning to work or volunteer, you will need a valid work permit. Your employer or volunteer organisation should arrange this before you travel. From December 2015, Carrying on Temporary Assignment (CTA) passes are no longer valid. If you’re working on a short term assignment you must apply to the Ministry of Labour and Employment for a short term work permit. The application should be submitted prior to entering the country. If you overstay the validity of your visa or permit you can be arrested, detained and fined before being deported. Reports made to the British High Commission by BAME British passport holders have indicated that they are experiencing additional levels of harassment from immigration officials. In these circumstances, you should stay calm and request that the Consular section of the British High Commission is immediately informed. Your passport should be valid for a minimum period of 6 months from the date of your visa application. UK Emergency Travel Documents, with a minimum of six months’ validity, are accepted for entry, airside transit and exit from Tanzania. Although Tanzania is not listed as a Yellow Fever endemic country, Zanzibar immigration officials may ask to see Yellow Fever vaccination certificates or exemption certificates upon arrival from the Tanzania mainland. Tanzania lies on an active fault line stretching from the north of the country to the south and tremors occur from time to time. The last significant earthquake (magnitude 5.7) happened on 10 September 2016 in the Kagera region, north west Tanzania. The US Federal Emergency Management Agency has advice about what to do before, during and after an earthquake. The Tanzanian Shilling is the official currency of Tanzania, but $US are also widely accepted in tourist areas. Dollar notes printed before 2009 are usually not accepted. You can exchange money at many authorised dealers, banks and bureaux de change. Get a receipt after each transaction. Most banks in major cities have ATMs, but they are not always reliable and sometimes break down or run out of money. To minimise the risk of card cloning, only use ATMs located within the bank. Travellers cheques are not widely accepted and non-Bank of England sterling notes may be subject to less favourable exchange rates.